Making sure your child eats a healthy and balanced diet is very important and is fundamental to their growth and development. But how can you ensure they are eating well at school? While school dinners have come a long way, they can be costly and sometimes, your child may not like what is on offer. 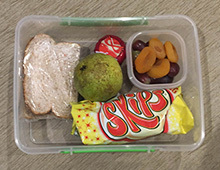 If you have chosen to give them a packed lunch, what can you do to ensure it is balanced and nutritious? What does the expert say? What should be included in your child’s lunchbox? We asked 1,000 parents what they believe is the most challenging part of providing their child with a healthy lunchbox. The top two ‘most challenging’ were fussy eaters, with 426 votes and cost and convenience with 371. Within the survey, we also asked parents if they thought schools provided enough information about child nutrition, 76% said no. We asked what they would like to know and 61% of parents would like more guidelines and nutritional information and 28% would like to be given more advice on what could be added to lunchboxes, rather than being told what to avoid. View the full Loveable Lunchboxes survey results. Nutritionist Resource member and nutritional advisor, Debbie Vanderboom explains. 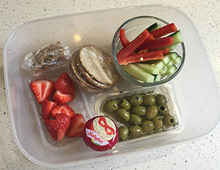 “Many parents throughout the UK are looking at ways to support their children’s growth, development and learning through healthy lunchbox ideas and snacks. When we take a closer look at nutrition, it is important to remember that food is information for the body and that quality, rather than quantity is what matters most. Creating lunchboxes that help to sustain energy levels for children can be simple, practical and convenient. The key is making sure that your child is getting a good quality source of protein, a healthy source of fat, fibre and is drinking plenty of water. These nutrients will help slow down the release of glucose that is found in the carbohydrate-based foods that provide us with energy. When these nutrients are removed (which we see in many processed foods and sugary drinks) the release of glucose is much quicker in the blood, leading to a crash in energy. This crash will leave your child feeling tired, unmotivated and often irritable. A helpful tip is to prepare a bit extra from dinners that can be used in lunchboxes in new and exciting ways. Roast chicken is a perfect example - serve with a whole grain wrap with chopped veggies. The other key component for energy, growth, development and the health of our children is to make sure they are getting a good range of minerals, found in plant-based foods. These are often forgotten and make up the foundations of optimal health. Children are constantly growing, so good nutrition is essential to health and development. But how do you know how much to feed your children? From our survey, we saw 57% of parents admit to not knowing the reference intakes for their children. As every person is different in terms of nutrition, reference intakes (RIs) are not targets, but are used to give an indication of how much energy and nutrients the average person needs. The term ‘reference intakes’ has recently replaced ‘recommended daily amounts’ (RDAs), though the premise is the same. It is important to remember that if your child is active, they may need more food and nutrients than a child that is less active. Find a nutrition professional near you for more information. 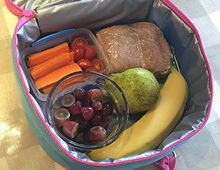 If you have decided to make pack lunches for your children, you will have full control over what goes into their lunch and the opportunity to include a wide variety of foods. It is important to check with your child’s school abides by any guidelines when it comes to lunchboxes, for example, if a student at the school has a severe food allergy, you may need to avoid adding trigger foods to the packed lunch. 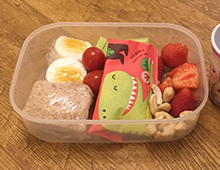 Whether you’re giving your child a packed lunch every day, or are just doing it now and then between school dinners, keeping them varied and coming up with new lunchbox ideas can be tricky. The key to a healthy lunchbox for kids is one that is balanced and provides all essential nutrients. Once you know which types of foods should be included, you can get creative! 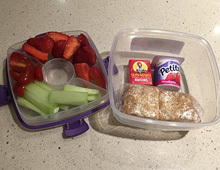 View our Rate my Lunchbox section for more lunchbox ideas and advice from our nutritionists. A child’s lunchbox should always include a healthy portion of fruit and vegetables. Eating a good portion of fruits and vegetables each day is an important part of a balanced diet. Variety is encouraged as different fruit and veg have different nutritional benefits. Getting children accustomed to eating a wide range of fruit and veg each day can help make reaching their five-a-day a habit. 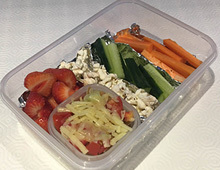 Aim for two portions of fruit and veg in a lunchbox, with at least one portion being a vegetable. When giving children fruit, the portion should fit into the palm of their hand. portion of dried fruits such as apple slices, mango or apricots. Protein is key for muscle development and will help keep children feeling fuller for longer. When it comes to meat protein, opt for lean meats, such as turkey or chicken. If a child doesn’t like meat, ensure they get enough protein through non-animal sources, such as beans and pulses. Try to include a portion of protein in the packed lunch most days. Calcium is incredibly important for children as it helps them to develop strong, healthy bones. Dairy products are a great way to ensure your child gets enough calcium, though if your child is unable to eat dairy, ensure you source calcium from non-dairy products, such as dark leafy greens, beans and sesame seeds. dips such as houmous, tzatziki or cream cheese. Growing children need plenty of energy and foods that will keep them full throughout the day. Starchy foods should be incorporated into every lunchbox alongside protein, dairy, fruit and vegetables. The following carbohydrates will provide children with slow-releasing energy, keeping them active and energised throughout the day. homemade pizza using English muffins, sliced tomato and cheese. It is important to stay hydrated and ensure your child is drinking enough fluids, so try to give them a water bottle to take to school. If your child doesn’t yet like the taste of water, add slices of lemon or lime, or a splash of sugar-free fruit squash for flavour. Another great option is to provide kids with a homemade green smoothie, using a maximum of two portions of fruit and a handful of leafy greens. Get them involved and have fun with this! Try to include a healthy source of fat (for example, natural peanut butter) and if possible, a source of protein (such as Greek yoghurt). Often children will need snacks throughout the day to keep them satisfied and energised between mealtimes. Try to have a mix of sweet and savoury snacks, though try to avoid high-sugar foods that may result in a crash, such as chocolate, sweets and cake. Debbie suggests some great ways to create healthy and balanced lunchboxes that will keep your kids excited through the week. ‘Courgetti’ or carrot noodles with meatballs and tomato sauce (the kids will love spiralising the veggies!). Veggie skewers with cherry tomatoes, cucumber, peppers, mushrooms and courgette, served with houmous and whole grain pitta. Sweet potato jacket (or mashed) with chicken, sweetcorn, peppers and avocado salad. Veggie omelette filled with their favourite veggies and a sprinkle of cheese. Wild rice or spelt pasta with tuna or chickpeas with pesto and veggies. Salmon fish cakes with chopped salad or veggie soup. Here is the recipe for a simple chocolate energy bite you could include in your kid’s packed lunch. It’s nut-free and will give them a boost of natural energy. Mix up 1 cup of soft dates with 1 cup of raw sunflower seeds. Add ¼ cup cacao powder and 1-2 tbsp of water. Get the kids to help roll them into 12 small balls and leave to chill. 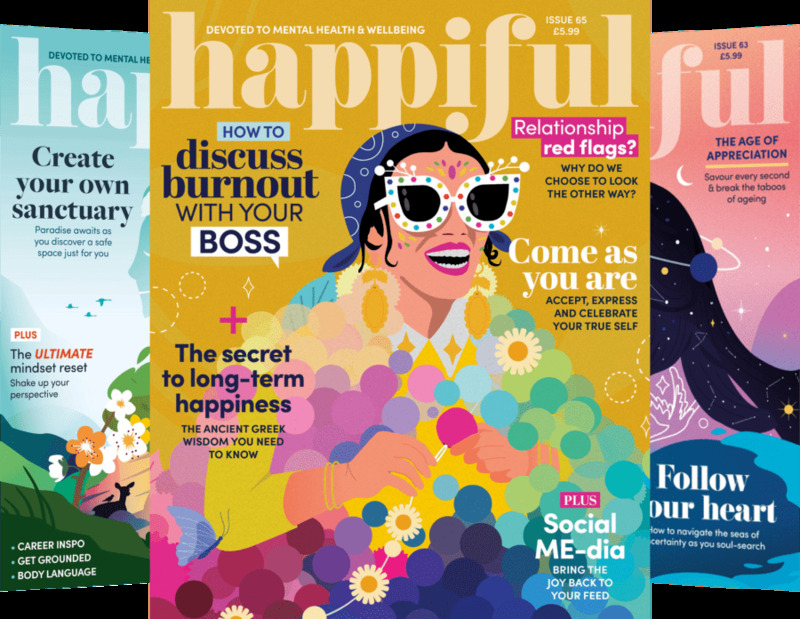 Content reviewed by nutrition professional, Debbie Vanderboom. All content displayed on Nutritionist Resource is provided for general information purposes only, and should not be treated as a substitute for advice given by your GP or any other healthcare professional.